Girls’ Respect Groups is a unique after-school program for preteen girls, led by specially-trained high school girls. 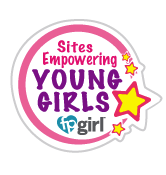 It’s a community of Girls Helping Girls, a place where teenage girls can share their life experiences and lend a helping hand to younger girls during the difficult middle school years. Working together, both sets of young women make choices rooted in self-confidence & self-respect. Girls’ Respect Groups is a wonderful way to build strength and compassion in our communities while anchoring young women in respect for themselves and others. Girls’ Respect Groups puts middle school girls directly in touch with kind-hearted, empathic teen girls, the people they most look up to, want to listen to, & want to emulate. GRG creates a safe place where girls of all ages can work together to stop the vicious cycle of girls bullying girls. Best of all, GRG is by & for real teens. 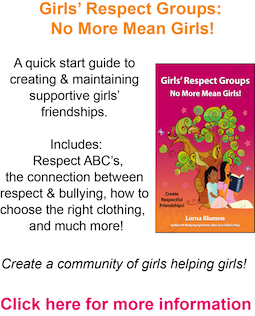 The GRG program has benefited from the contributions of amazing teen girls who have helped develop GRG lesson plans and co-authored our book about the GRG program, Girls’ Respect Groups: An Innovative Program To Empower Young Women & Build Self-Esteem! (Camberley Press, 2009). It’s a perfect example of how teens, given half a chance, can do outstanding things. As one of our teen leaders said, “It’s a chance for teens to turn heads for the right reasons!” The GRG Program is used in the US, Canada, and over 130 countries worldwide. 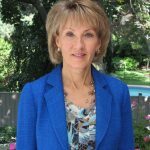 LORNA BLUMEN, MS, MBA is a children’s and adult workplace bullying prevention specialist. She is the author of five books, including Bullying Epidemic: Not Just Child’s Play and Girls’ Respect Groups: No More Mean Girls! Lorna is the lead developer of the Girls’ Respect Groups Program, used in over 130 countries. Lorna has appeared on Canadian and US television and radio and spoken at international conferences. For more info about her work, visit BullyingEpidemic.com and IGYBBook.com.